October 7, 1830, Hanover County, Virginia. Note: Some genealogies say 1829, but his tombstone says 1830. Lone Oak Cemetery, Leesburg, Florida. 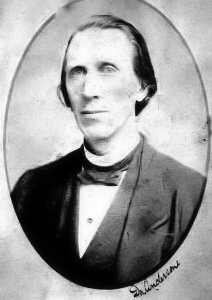 Josephus was the son of Ro­bert Anderson, and husband of Vir­gin­ia L. Ven­a­ble (married 1851). He became a minister in the Meth­od­ist Epis­co­pal Church, South, in 1848. The preface to his book The Bible Christian indicates he was living in Rich­mond, Vir­gin­ia, as of 1855. He moved to Flor­i­da shortly thereafter, where he was a presiding elder of his District, a delegate to the Meth­od­ist General Conference, and president of the Board of Trustees, Flor­i­da Conference College. In 1876, he received a Doctor of Divinity degree from Em­o­ry Col­lege, At­lan­ta, Geor­gia.